There are 2 ways to post fees and accept payments for store item(s). Store > Make A Sale allows you to choose a family or store. 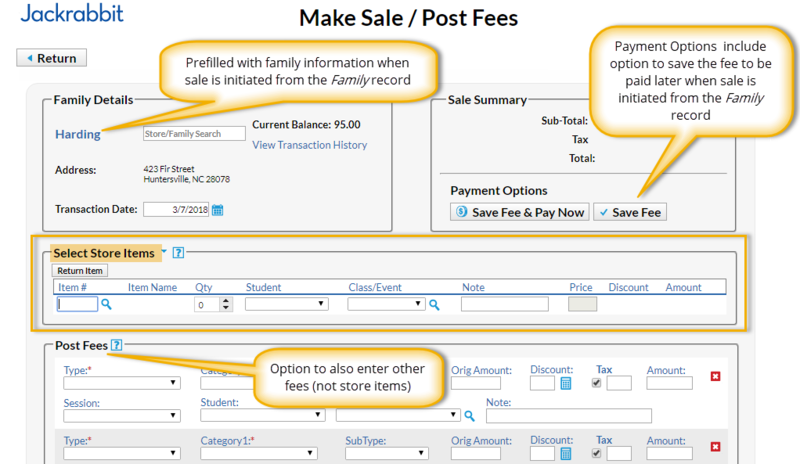 The Make Sale / Post Fees button on a Family page allows you to complete a transaction for a specific family. Either option opens the Make Sale / Post Fees screen. When you initiate your sale from the Store menu > Make a Sale , the default store information is automatically added to the Store Details section. If you have multiple stores the default is set to the first store that was added to your database, as identified by the Store ID that was created for it at that time. The Store ID is located on the Summary tab of the Store record, on the bottom right. When you initiate your sale from a Family record > Make Sale/Post Fees button, the family's information is automatically added to the Family Details section. If the sale is for a different store or family enter a portion of the name into the Store/Family Search field. Jackrabbit will begin searching for any matches after the first letter is typed in. A list of all matches is displayed, and the correct one can be selected from the list. 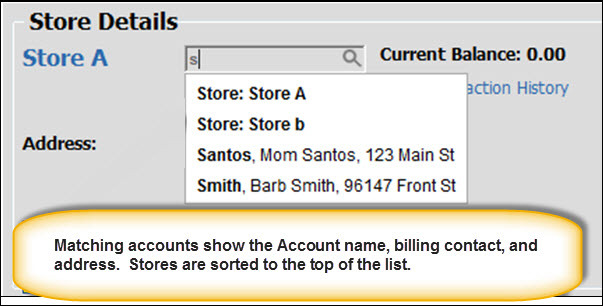 All Store accounts are listed with 'Store:' in front of the name to help differentiate between stores and families. Stores are also sorted to the top of the list. To assist in finding the correct family, each account displays the store/family name and billing contact’s name and address. The Select Items section is for entering Items being sold. When you first open the Make Sale screen, the cursor will be in the Item # search box. The search will help you find the exact item you are looking for. You can enter the item number manually or use a barcode scanner. The item’s price and other details will appear on the transaction line as soon as the item is selected. The quantity can be increased by using the up and down arrows. If the transaction is for a Family, the student and class can be selected (these are inactive for store accounts). Note that the tax is totaled in the Sale Summary section. Click on the magnifying glass icons (next to Item # and Class) to search or display a list of item #s or classes. If there’s a discount for an item, you can enter the discount amount (not percentage) or click on the calculator icon. The calculator icon opens up a Discount window where you can enter the discount amount, discount percentage or click on a Quick Discount button. The Quick discount buttons will calculate the correct amount. Optionally, other types of transactions can be added in the Post Fees section. If there is more than one fee to post, use the Add New Row button to add another fee transaction line. Mistakes can be edited on any line or deleted by clicking on the red x icon. If payment is being received at the time of the sale, click Save Fee and Pay Now . If the fees will be paid at a later date, click Save Fee. If the transaction is for a Store account, only the Save and Pay Now button is visible. After clicking on a blue payment button, if the family has a prior balance, you'll be asked if the full balance is being paid. If Yes is selected, then the full balance will appear as the payment amount. If No is selected, then only the amount of the transactions just entered will be the payment amount. If you don’t see the Payment Transaction Entry page after clicking a payment button, check your pop-up blocker and allow the pop-up. This will process the payment amount using the credit card/bank draft information on file (Family's Billing Info tab). This button is inactive for store accounts because they do not have credit cards on file. The card can be swiped with a card swipe reader or the credit card information can be manually entered. When using the Store account, the card is processed for this transaction ONLY. No credit card information is saved. 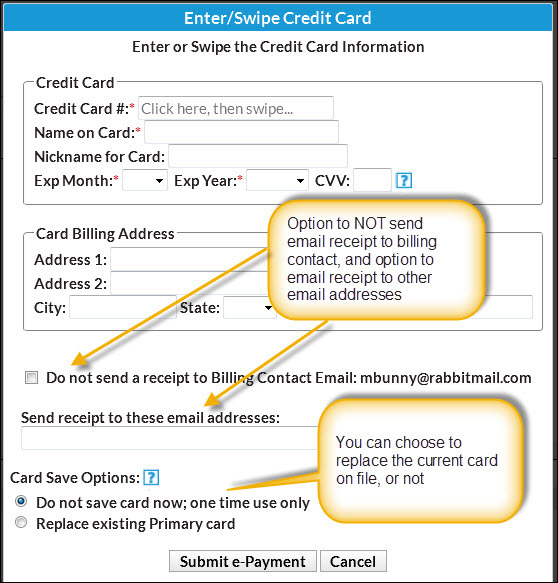 When using a Family account, an option is offered to save the credit card information (if no card is currently on file) or replace the existing credit card (if a card is already on file). If the Family Billing Contact has an email address, the email receipt confirmation is automatically sent to this email address unless the Do Not Send box is checked. To email a confirmation to another email address, enter the email address(es) in the space provided. 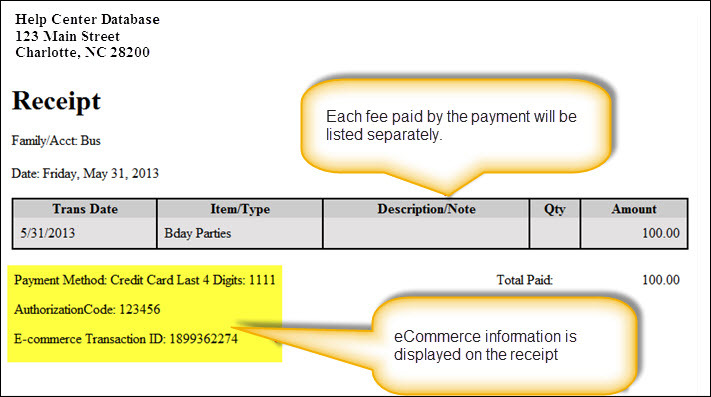 In the Payment Transaction Entry page, check the Print Receipt box. The receipt lists all fees related to the payment. e-Commerce payments include the approval code, transaction id code, and last 4 digits of the card number. Payment notes also appear on the receipt. Receipts that are emailed with credit card transactions only include the total amount of the transaction. Receipts print to 8 1/2 x 11 printer paper only.